2.5 x 2.5 cross stitch pineapple motif. 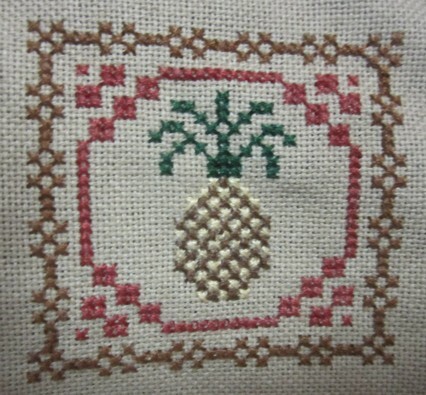 The other day I was looking for some Easter cross stitch patterns and found this pineapple motif. The pineapple was part of a sampler. I never seem to be able to do cross stitch. Counting threads and working colorful threads into the right holes defeats me. But this pattern was very simple and used only four colors. So I was able to make the cross stitch using a scrap of 28 threads per inch cotton over 2 threads. I'm very proud that I was able to stitch the pineapple. Yesterday I started a hardanger doily and it is so much easier then cross stitch. 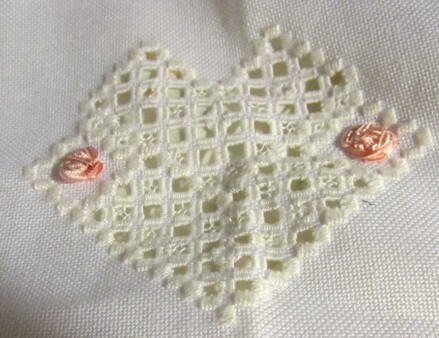 Hardanger is easy because the fabric is woven 2 threads together equalling 22 threads per inch. Then cloister stitches, 5 stitches over 4 threads, is worked back and fourth creating the edges. When the edges are done threads are cut and drawn out of the design. Then the threads remaining are woven into different designs. Hardanger motif edges done in closter stitches. 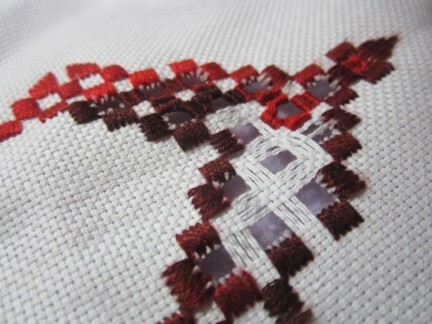 Hardanger motif with threads drawn out and needle weaving started. The handanger doily﻿ is waiting to be worked on. I'm thinking of adding two more diamond shapes to make it wider. The design has to have lined up closters or it will fall apart when cutting. So I am being very careful and will work on it when my head is clearer. Ooh, pretty! I like the pineapple. I want to start trying new stitches (I only Cross Stitch at the moment) but I'm a little scared to! Thank you so much. 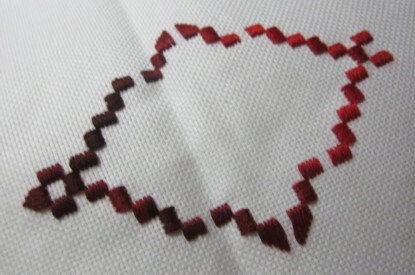 I admire cross stitchers so much. Usually I get excited and get a pattern and fabric ready and after 10 stitches throw it across the room! So that pumpkin was one of the few cross stitch patterns I have finished. Embroidery is such a rich hobby. From cross stitch to stumpwork there are so many different forms and styles of embroidery. You might start by contacting your local Embroider's Guild of America http://www.egausa.org They have monthly meetngs and classes. Here in Santa Maria our local junior college has needlework classes. It is fun having others to stitch with. Good luck with your embroidery, I would love a link to see your work.